In many ways, Alice in Chains was the definitive heavy metal band of the early ’90s. Drawing equally from the heavy riffing of post-Van Halen metal and the gloomy strains of post-punk, the band developed a bleak, nihilistic sound that balanced grinding hard rock with subtly textured acoustic numbers. They were hard enough for metal fans, yet their dark subject matter and punky attack placed them among the front ranks of the Seattle-based grunge bands. While this dichotomy helped the group soar to multi-platinum status with their second album, 1992′s Dirt, it also divided them. Guitarist Jerry Cantrell always leaned toward the mainstream, while vocalist Layne Staley was fascinated with the seamy underground. Such tension drove the band toward stardom in their early years, but following Dirt, Alice in Chains suffered from near-crippling internal tensions that kept the band off the road for the remainder of the ’90s and, consequently, the group never quite fulfilled their potential. 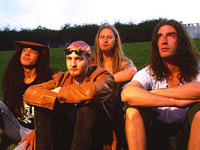 Staley formed the initial incarnation of the band while in high school in the mid-’80s, naming the group Alice N Chains. Staley met Cantrell in 1987 at the Seattle rehearsal warehouse the Music Bank and the two began working together, changing the group’s name to Alice in Chains. Cantrell’s friends Mike Starr (bass) and Sean Kinney (drums) rounded out the lineup,and the band began playing local Seattle clubs. Columbia Records signed the group in 1989 and the label quickly made the band a priority, targeting heavy metal audiences. Early in 1990, the label released the We Die Young EP as a promotional device and the song became a hit on metal radio, setting the stage for the summer release of the group’s debut, Facelift. Alice in Chains supported the album by opening for Van Halen, Poison, and Iggy Pop, and it became a hit, going gold by the end of the year. As the band prepared their second album, they released the largely acoustic EP Sap in 1991 to strong reviews. Prior to the release of Alice in Chains’ second album, Seattle became a media sensation thanks to the surprise success of Nirvana. As a result, Alice was now marketed as an alternative band, not as a metal outfit, and the group landed a song, the menacing “Would?,” on the Singles soundtrack during the summer of 1992. “Would?” helped build anticipation for Dirt, the group’s relentlessly bleak second album that was released in the fall of 1992 to very good reviews. Following its release, Starr left and was replaced by Mike Inez. Dirt went platinum by the end of 1992, but its gloomy lyrics launched many rumors that Staley was addicted to heroin. Alice in Chains soldiered on in the face of such criticism, performing successfully on the third Lollapalooza tour in 1993, which helped Dirt reach sales of three million. The band released the low-key EP Jar of Flies in early 1994. It debuted at number one upon its release, becoming the first EP to top the album charts. Despite the band’s continued success, they stayed off the road, which fueled speculation that Staley was mired in heroin addiction. Later that year, Staley did give a few concerts as part of the Gacy Bunch, a Seattle supergroup also featuring Pearl Jam‘s Mike McCready, the Screaming Trees’ Barrett Martin, and John Saunders. The group subsequently renamed itself Mad Season and released Above in early 1995. Later that year, Alice in Chains re-emerged with an eponymous third album, which debuted at number one on the American charts. Again, the band chose not to tour, which launched yet another round of speculation that band was suffering from various addictions and were on the verge of disbanding. The group did give one concert — their first in three years — in 1996, performing for an episode of MTV Unplugged, which was released as an album that summer. Despite its success, the album did nothing to dispel doubts about the group’s future and neither did Cantrell’s solo album, Boggy Depot, in 1998. Cantrell basically released Boggy Depot because he couldn’t get Staley to work, but its very existence — and the presence of Inez and Kinney on the record, not to mention Alice producer Toby Wright — seemed to confirm that the group was on moratorium at best, defunct at worst. Staley, for his part, stayed quiet, conceding his spot on Mad Season’s second album to Screaming Trees singer Mark Lanegan. In 1999, Sony put together a three-disc Alice in Chains box set, Music Bank, divided between the group’s best work and assorted rarities. At the turn of the new millennium, Columbia Records issued Live, which plucked material from bootlegs, demos, and festival shows covering the years 1990, 1993, and 1996.